The study of tanker shipping and tanker spills by Genivar for Transport Canada has revealed huge gaps in how the world monitors tanker traffic. Accident data was acquired from three main sources: the CCG Marine Pollution Incident Reporting System (MPIRS); the Lloyd’s casualty database; and spill incident records maintained by the International Tanker Owners Pollution Federation (ITOPF). It goes on to note that some key data has not been updated since the 1990s, largely prior to the introduction of double hulled tankers. As noted, oil spill accidents were compiled on a worldwide basis. In order to estimate the frequency for Canada, an exposure variable was required. the Bureau of Ocean Energy Management, Regulation and Enforcement) investigated the occurrence rates of tanker accidents against various spill exposure variables and found that the simplest and most reliable indicator was volume of oil transported. Simply put, it was determined that spill rates could be expressed, for a range of spill size categories, as an average number of spills per billion barrels transported. The MMS studies were updated periodically until the 1990s but have not been revisited since, but they did show a steady decrease in the likelihood of casualties and resulting spill volumes, due to a number of factors including tanker design, increasing governance and overall scrutiny of the marine transportation industry. The phased-in implementation of double-hull tankers may have also had a beneficial effect on spill rates in more recent years, particularly in the category of very large or catastrophic events… In any case, it is important in interpreting accident data to reflect current trends and implemented mitigation measures. The focus was on cargo volumes and accident rates over the past decade. It goes on to say the volumes of crude carried is also under-reported to Lloyds. Again about Lloyds data, until 2010, it was limited in its monitoring of the BC Coast. In analyzing the Canadian movement data supplied by Lloyds, a major shortcoming was found in the data in that movements recorded prior to 2010 did not include broad classes of vessels such as ferries, passenger vessels, and pilot boats. Given that these vessels comprise a significant proportion of traffic movement in many sectors, only data covering the final two years of the record, 2010 and 2011, were used in the analysis. One limitation of the MPIRS data was that it did not classify spills as to whether they were from “cargo” as opposed to “fuel”, which would have been helpful in this study as these spill types were analyzed separately. As a result, for spills of refined products, which could have hypothetically been either cargo or fuel, assumptions were made based on the type of vessel involved, the type and severity of the incident, and other notes within MPIRS. referencing with other data sources. 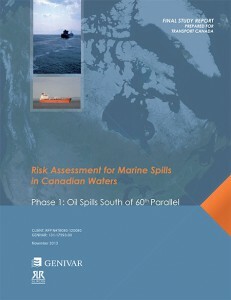 So the Genivar report exposes a significant gap in the available data on oil spills. It is certainly true that the number of major tanker accidents and spills have decreased since the Exxon Valdez disaster, a point frequently made by Enbridge at meetings in northwestern BC. The expert panel report which said that Canada faces the risk of a major tanker disaster of 10,000 tonnes or more once every 242 years. Note that the government always talks about a “major oil spill,” but it appears from the gaps in the data that predicting the possibility and consequences of a medium sized or smaller oil spill is now not that reliable, even though such a spill could have disastrous effects on a local area. According to a map in both reports, the entire BC coast is at risk for a “low to medium” spill. This echoes the problems with the Enbridge Northern Gateway pipeline, where Enbridge based most of its projections on a “full bore breach” or major pipeline break and did little about a medium sized or smaller leak. Data analysis by Kelly Marsh of Douglas Channel Watch on the possibility of the cumulative effects of a medium sized and possibly undetected pipeline breach could have just as disastrous consequences for the Kitimat valley as a major pipeline break. The same is likely true at sea. The United States Department of Transportation Maritime Administration has issued a call for a study that is calling into question the future of double-hulled oil tankers. On August 6, 2012 the Maritime Administration, also known as MARAD, issued a “solicitation” for a study on the Safety, Economic and, Environmental Issues of Double Hulls. Following the Exxon Valdez disaster, the passing of the Oil Pollution Act of 1990 (OPA 90) led to the requirement to replace single hull petroleum tankers with double hull tank vessels sailing in U.S. waters. This requirement was soon adopted by the International Maritime Organization (IMO) and became a worldwide regulation. This means that, today, tank vessels worldwide are carrying thousands of extra tons of steel in order to meet the double hull requirements. Though these double hulls reduce the threat of oil pollution as a result of grounding, they significantly increase the amount of energy needed to propel a vessel and increase the amount of air pollution into the atmosphere. As a result, the maritime industry’s carbon footprint and criteria pollutant emissions are increased. In addition to the need to burn more fuel, it is acknowledged that double hulls can cause several other problems which will be detailed in this study. Here in Canada, Enbridge Northern Gateway and its supporters, in briefings on maritime and tanker safety on the west coast of British Columbia, have always said that the changes following the Exxon Valdez disaster in Prince William Sound and the subsequent US Oil Pollution Act as almost guaranteeing that such a disaster could not happen again. Now it appears that some people in the U.S. Department of Transportation may be worried that increased use of double-hulled tankers will cost too much. There’s also the apparent question of balancing the carbon footprint of increased emissions from tankers with the danger from a hydrocarbon spill. In July last year, the IMO adopted binding regulations to limit the expected gas emissions increase by reducing fuel consumption of ships by as much as 15 million tonnes in 2020, a 14 per cent reduction, and by 2050, by as much as 1,013 million tonnes. This will lead to savings in fuel costs for the shipping industry of up to US$200 billion a year, says the IMO. The National story says even the tanker industry itself is worried about the move, quoting the the international tanker owners’ organization. “We have noted reports about Marad’s intended study on tanker double hulls but, except for what we gather from press articles, we have little knowledge on the reasoning behind this,” said Bill Box, Intertanko’s senior manager for external relations. 1. The Contractor shall conduct an assessment of the history in the evolvement of “The Double Hull Rules”. 2. The Contractor shall conduct the assessment of any rules that are being proposed in bodies such as the IMO, U.S. Congress and other such bodies’ worldwide as they relate to additional hulls for environmental reasons. 3. The Contractor shall assess all the relevant safety issues related to double hulls for each class of vessel. E.g. Double bottoms are difficult and expensive to maintain and can result in corrosion problems. Unchecked corrosion in older double hull vessels can lead to cargo leakage into a double bottom and the buildup of dangerous vapor which could cause an explosion under certain conditions. The Contractor will obtain data from appropriate organizations which details the issues in double bottoms on older vessels including cracking, leakage, and the potential for vapor buildup. 4. The contractor shall conduct a complete economic study of the consequences of Double Hulls. E.g. 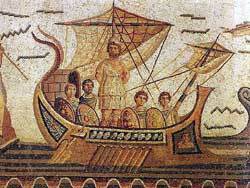 they significantly add to the construction cost of vessels. They result in the loss of cargo space which also adds to the carbon footprint since an additional vessel(s) is needed to carry the same cargo tonnage. 5. The contractor shall assess the complete consequences of the carbon footprint of designing, constructing, maintaining and operating vessels with double hulls. E.g. Apart from the extra propulsive forces and fuel needed, the carbon footprint of double hull maintenance is substantially increased. 6. The Contractor shall prepare a report on the results of the project. The report shall be grammatically correct and must be professionally written to a high level of competence in the English language. The report must clearly specify the safety, economic and environmental issues details above. 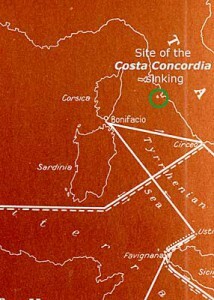 The track of the Costa Concordia before it ran aground, based on data from Lloyd's List and posted on the BBC News website. Tracking data obtained by the definitive British shipping news service, Lloyd’s List (subscription required) and posted on both the Lloyd’s and the BBC News websites show that the cruise ship Costa Concordia was far off its assigned and programmed course before it ran aground near the island of Giglio. 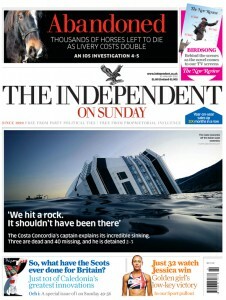 The captain blames the disaster on rocks which were not on his chart. The data shows that the Costa Concordia, with 4200 passengers and crew on board veered close to the island of Giglio before hitting rocks just 150 metres from shore. The closest any cruise ship has ever been authorized to come close to the island is 500 metres. 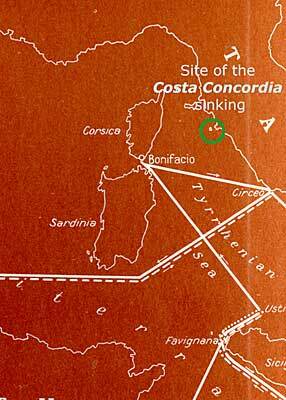 The course of the Costa Concordia, heading straight for an island, looks similar to the course taken by the Queen of the North when it hit Gill Island. The difference, of course, is that while the Queen of the North failed to make a course correction at Wright Sound, the Costa Concordia was apparently deliberately taken off course. The captain of a Carnival Corp. cruise liner ordered the ship off its programmed route, an “error” that caused it to hit rocks off Italy’s coast in an accident that killed at least six people, the chairman of the cruise ship’s operator said. According to Reuters and other news reports, the danger is a devastating oil spill from the capsized ship. Italy risks environmental disaster if ship fuel leaks. As the Costa Concordia shifted dangerously on Monday, Italy’s environment minister raised the prospect of an environmental disaster if the 2,300 tonnes of fuel on the half-submerged cruise ship leaks. The area where the ship capsized, off the island of Giglio, is a natural maritime park noted for its pristine waters, varied marine life and coral. It is known as an excellent diving site. Related Links: RMS Titanic There are now so many comparisons to the sinking of the Titanic, almost a century ago, with the sinking of the Costa Concordia, that Google News has now created tracking link for those stories.